One day, Abbie Mifsud was acting lethargic for the normally bright and bubbly six-year-old. A week later, she couldn’t walk in a straight line – and five months later, Abbie was gone, killed by the aggressive brain cancer, diffuse intrinsic pontine glioma (DIPG). When Abbie was diagnosed in 2011, her mother, Amanda, was horrified and astounded to find out that all doctors could offer her daughter was palliative care. DIPG is 100 percent fatal and, like Abbie, half of children it strikes die within a year of diagnosis. After losing Abbie, Amanda started a nonprofit called Abbie’s Army, which raises money for research on possible treatments. Today, families face the same odds, but around the world scientists are trying novel approaches in desperate attempts to offer patients and their families any hope or relief. Scientists are tying everything from drugs to turn off genetic mutations in the disease to even injecting viruses into the brains of young children, according to studies presented at the American Association for Cancer Research. 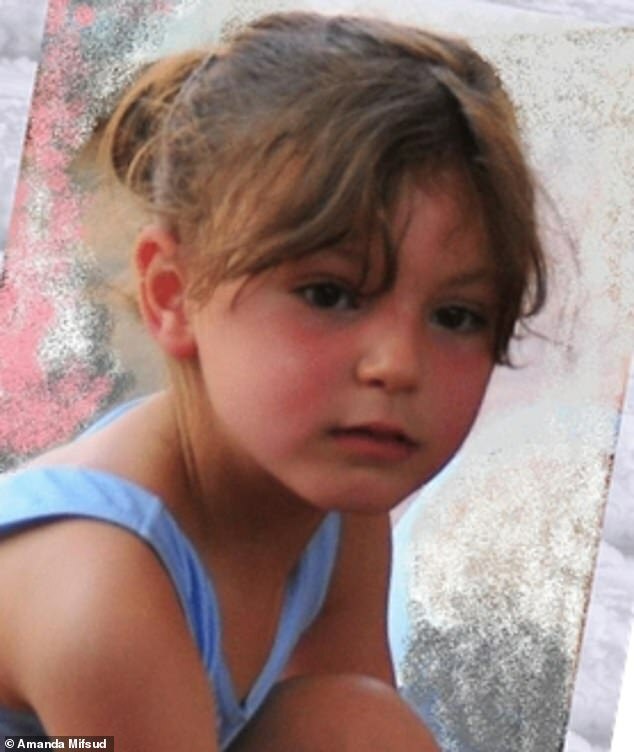 When it became clear to the Mifsud family that Abbie’s problem was neurological, and serious, they were ready for a fight but, of course, wanted to know her odds. 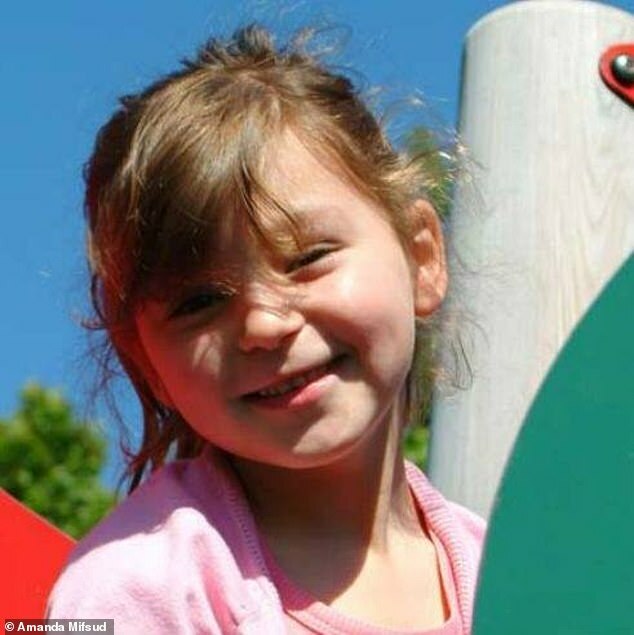 ‘When I asked the consultant the inevitable question, [I thought] because Abbie was so spirited, that if there was any percentage chance that someone could make it, she’d be one of the ones,’ Amanda told Daily Mail Online. ‘No, no, no such thing. It turned out to be a big fat zero,’ she says. ‘They call it a fight, but it’s one that, at the moment, you can’t win. DIPG, or diffuse intrinsic pontine glioma, is a rare type of tumor that accounts for between 10 and 20 percent of childhood cancers. It is fatal within five years for over 99 percent of children with the devastating disease. Researchers at the University of Navarro in Pamplona, Spain, think their modified virus could change that – but experts say that, like most treatments, the experiment is promising, but could easily still fail, as many before it have. 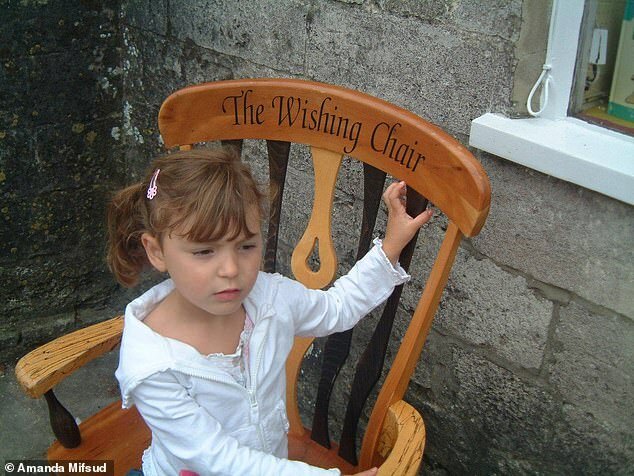 Parent advocates from around the world have joined forces to raise funds for groups like the Institute of Cancer Research (IRC), based in the UK, which are pursuing just about every potential therapy for DIPG imaginable. Right now, the group is focused on genomically sequencing DIPG tumors in order to develop better targeted therapies, instead of just blindly hitting out at the cancer with any garden variety drug that has worked in adult brain tumors. DIPG is one of the few cancers that has remained virtually untouched by medical advances thus far. While the explosion of immunotherapies and targeted therapies have given years back to even elderly patients with stage four lung and breast cancers, half of young children with DIPG are still dying within a year. DIPG is a type of brain tumor that starts growing in the brain stem – which plays a vital role in everything from breathing and heart rate to walking and talking – and spreads aggressively through a kind of fatty brain cells. It typically develops in children between ages five and 10, though adults occasionally get the cancer, too. The symptoms are often rather vague, which can delay diagnosis. Abbie, for example, was just acting ‘off and wobbly,’ and seemed to lack energy, her mother said. Initially, the family was told to simply come back to the doctor in six weeks if her symptoms progressed. But with DIPG, even an early diagnosis wouldn’t afford sufferers a treatment. The brain stem is so precious that surgeons can’t operate on tumors there. Until recently, they couldn’t even be biopsied safely. Instead, DIPG is usually treated with radiation therapy. For 70 percent of patients, this shrinks the tumors and helps to alleviate symptoms like vision and hearing problems, trouble controlling facial muscles, including swallowing, trouble walking, nausea and vomiting. But the tumors always overcome the effects of radiation. Abbie was immediately started on radiation therapy after her diagnosis. 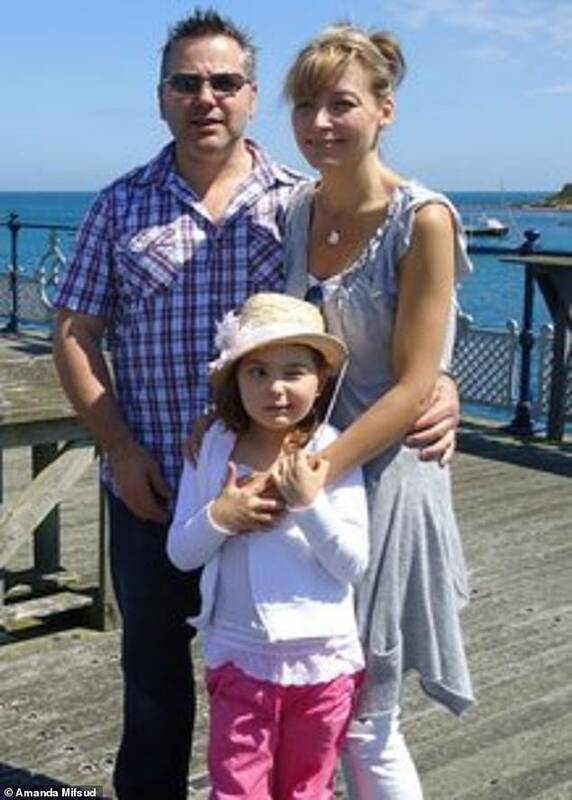 The Mifsud family had to 150 miles round trip each day from their home in Ashford, Kent, to the hospital where Abbie got the treatment. It was grueling, exhausting, and ‘you know it’s only to get them back for a little bit,’ Amanda says. And worst of all, it was clear to Amanda that her daughter knew what was happening to her. Over the course of the last 30 years, scientists have tried treating DIPG with chemo, but to no avail. In fact, none of the assorted chemotherapies they tried offered any benefits over radiation. For about six weeks, radiation seemed to alleviate some of Abbie’s symptoms. But when its effects began to wear off, she started to decline immediately and dramatically. The Mifsud family spent about a week in the hospital. As the tumor continued to infiltrate Abbie’s brain further and further, she lost the ability to swallow, so Amanda and her husband, Ray, had to suction fluid out of her throat, to keep her from ‘drowning’ in secretions, Amanda says. ‘Bless her, she ended up basically a head on a pillow. After a week at the hospital, the Mifsuds took Abbie home, and called her family to say goodbye. Abbie had one last night at home, nestled between her parents. By early morning, on September 13, 2011, she was gone. ‘It’s excruciating – there’s no other word for it,’ Amanda says. But while some families might have tried to get as far away from the disease, Amanda and Ray leaned into the DIPG community, and started Abbie’s Army. 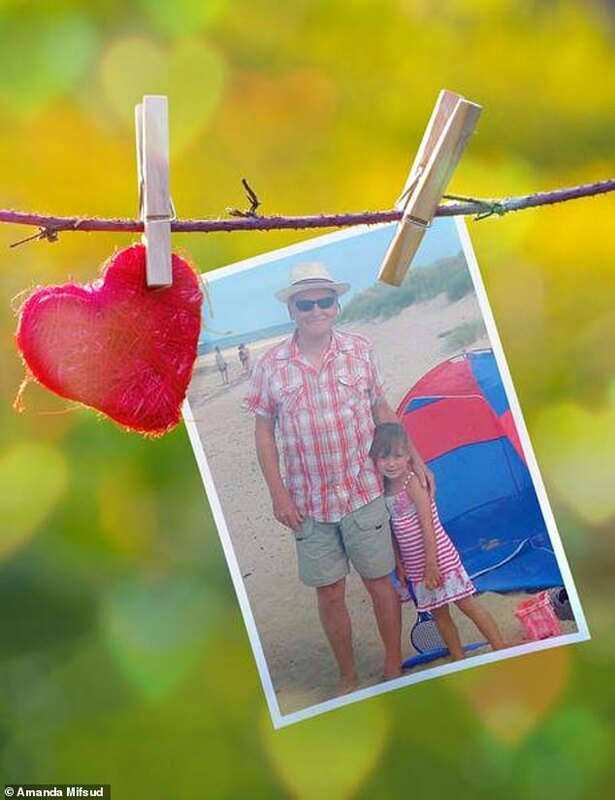 ‘What’s compelled us is that it made no sense to us at all that, here was our daughter, who was going to be dead in a very short time, and she didn’t receive one drug’ to treat the disease, Amanda says. There are over 40 clinical trials recruiting DIPG patients, according to the US-based DIPG Registry. In the UK, Amanda says there are only a couple such trials actively looking for patients. Most of the research on DIPG is still in its pre-clinical stages, when scientists are developing therapeutics by studying cells or animal models. Often, research shows remarkable promise at these stages – but fails to treat children with DIPG. For example, Spanish scientists are injecting tumor-killing viruses into the brains of children with the incurable pediatric cancer, DIPG, research presented at the American Association for Cancer Research reveals. The team is using a modified adenovirus to kill tumor cells. The virus also revs up an immune response, supercharging attacks against the cancer. DIPG’s location in the brain stem makes it difficult for immuntherapies – typically delivered through an IV or in a pill – to reach the fast-growing tumors. To get around that problem, the scientist devised a long thin tube that is inserted into a small hole drilled in the skull and delicately navigated to the tumor to directly deliver the drug to its target. The therapy’s effects in mice have been remarkable, even curing them of the tumors in some of its iterations. So far, they group has only recruited eight of the 12 patients they are aiming for for a phase one trial. At this stage, they aren’t looking for how effective the treatment is – just how toxic it isn’t. They’ve found no toxicity, two patients who were recruited when their tumors were already large and invasive have died and one dropped out of the trial. The five patients remaining have so far seen reductions in the size of their tumors – but none of them has been in the trial longer than 28 weeks (seven months). Dr Martinez Velez says that one patient is even alive 12 months after the virus was injected, and there are no signs of of tumor presence. It’s a novel approach to the DIPG problem, but the treatment is not yet being tested for efficacy, just for safety. Dr Chris Jones of ICR did not work directly on the study, but contributed to the genomic sequencing that informed the trial. Dr Jones calls the research ‘a potentially interesting avenue,’ but notes that what happens in mice doesn’t necessarily happen in humans. Amanda has spoken to the researchers, but doesn’t want to jump to conclusions yet. ‘It’s just too early, it’s another avenue that needs a whole load of research,’ she says. She notes that, like many treatments that have failed in kids with DIPG, this method is based on one used in adults. ‘We have this entire research field that’s entirely reliant on adult studies,’ but often doesn’t translate. She is more encouraged work to create a treatment in light of the discovery of a mutation in the tumors related to the ALK2 proteins. Treatments in development related to the mutation are ‘biology based,’ she says, instead of shots in the dark. A group called Medicines 4 Kids (M4K) Pharma has made quick progress toward a therapeutic that to block the tumor-fueling activity of ALK2, but it could be a year or more before they can start clinical trials. This is the frustration for the families who are the driving – and funding – force behind DIPG research: everything takes time, and so much research is in its infancy. ‘It’s a huge challenge because, on one hand, you want to provide treatments that are data driven,’ Amanda says. ‘But to a parent actually trying to save a child, you’d do anything.